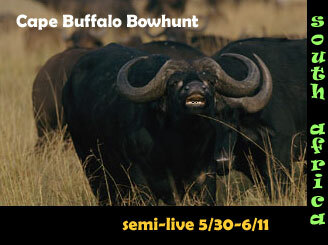 This 13-day Semi-live bowhunt takes place in the Limpopo Province of South Africa. 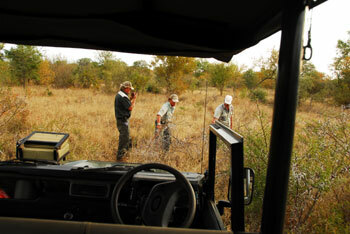 This is a continuation of our very challenging, yet unsuccessful hunt last year for cape buffalo. Like last year, my hunt requirements were the same: I wanted to hunt a buffalo on foot on a very large ranch only this time there were not one, but hundreds of buffalo. While I am very much aware that there are other, more successful methods of bowhunting buffalo, I wanted to experience the thrill of stalking animals that were wide-awake and as sharp as can be. Like my previous hunts this area is very large, many thousands of acres. We are not hunting "project" buffalo (tame) or put and take buffalo. Per my requirements I wanted to hunt wild animals in fair chase conditions on foot. These buffalo have been here for generations, they have survived rifle hunters, leopards and hyenas which were prevalent on this ranch. I was warned ahead of time, this was not going to be a walk in the park. My first day is always special in Africa. This is my second buffalo hunt and my fourth trip to the Dark Continent. In actuality, you could say this hunt was a continuation of last years’ buffalo hunt. You see, since I was unsuccessful and never got a shot at a buffalo, Jimmy and Linda Taljaard of Madiakgama Safaris asked me to come back and continue our hunt. It took me all of a half-second to respond "yes." But this hunt would be different than our hunt last year. Although last years’ hunt was extremely challenging (one old bull on a large farm) I was looking for something different this year. I wanted to bowhunt again to a large property with an established herd of buffalo. Not an easy request for a bowhunter in South Africa but that was my desire. And just like last years’ bull, I wanted to track, then spot and stalk my buffalo. 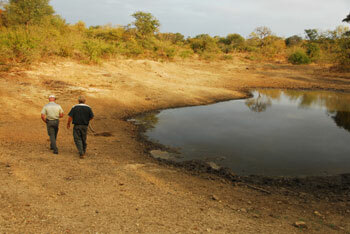 Jimmy and Linda delivered and located a large concession adjacent to Kruger National Park. They knew of a large property that had hundreds of buffalo. The owner thought what I was asking to do was foolish but agreed to the bowhunt given my experience and previous hunts in africa. He worked with RSA authorities to get me a bowhunting permit (required since bowhunting dangerous game is illegal in this province without a special permit) and our hunt was arranged. The drive took several hours over two days. 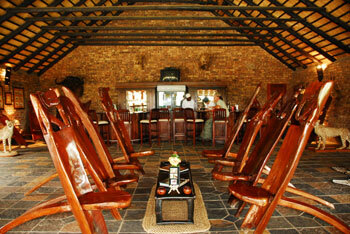 Before long we were in Hoedspruit and Roc Safaris, which is located in the Limpopo Province of RSA. We met Rocco Gioia, the owner of property and were shown around their immaculate 4-star Landela Lodge. We had a bite to eat and then sat down to discuss the hunt. Rocco is a passionate hunter who cares deeply about hunting in RSA. He was not shy to share his opinions with me, he didn't think I could successfully stalk a wild buffalo within bow range, get a close-ethical shot and cleanly recover the animal. He truly believed, and told me that it was "impossible" it couldn't be done. He then went on to tell me things I already knew. There are buffalo, and there are Buffalo. There are many outfits which will sell you a put and take buffalo they call "Project Buffalo." They have become domesticated and used to truck feedings by humans. He was very adamant about ethical hunting and the rules for hunting at his ranch. There was zero tolerance for truck hunting, shooting from trucks, or any method which flies against the rules of fair chase. He told me how many of the 'big name' bowhunters are hunting buffalo he suspects had foul play involved. He knew the tricks, some involved darting the buffalo ahead of time, some may have been shot in the guts by a rifle, the majority looked like tame project buffalo. It was all very interesting but I assured him, and Jacques and Jimmy backed me up - that we were in sync. They told him the story of the truck incident last year where I refused to shoot that wild buffalo after it had been herded by the driver of the truck. I think this set Rocco's mind at ease. Still, it was obvious to me that he was skeptical of me and my chosen method to bowhunt buffalo. He was also aware of the fact that his buffalo were about as wild as can be. With all of that conversation behind us we headed back to our guesthouse where I put my bow together, shot a bit, and then changed into some hunting clothes for our afternoon drive. so we can reach the more remote areas. We loaded up into the big Land Cruiser for our first look at the property. I liked what I saw. We spotted no buffalo, but looking at the sign (tracks, droppings, rubs), there was no doubt this place was loaded with buffalo. I was getting excited already. but as you can see, these holes were not setup for bowhunting. We headed back to the lodge and visited with Rocco and his wife Yvonne over a wonderful dinner before heading back to our guesthouse for the night. Tomorrow morning we meet Coleman, our Tracker/Professional Hunter and at 6:00AM we begin bowhunting a cape buffalo for the second time. This hunt was going to be rough but were were certainly not roughing it. 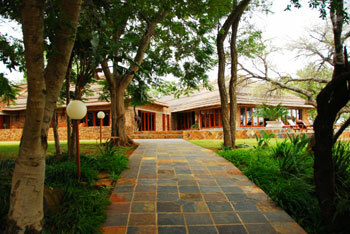 This was probably the most lavish lodge I had ever stayed at in Africa.